SL Green has a large Manhattan portfolio and wanted an interactive presentation system that brokers could take with them on site tours with prospective tenants. 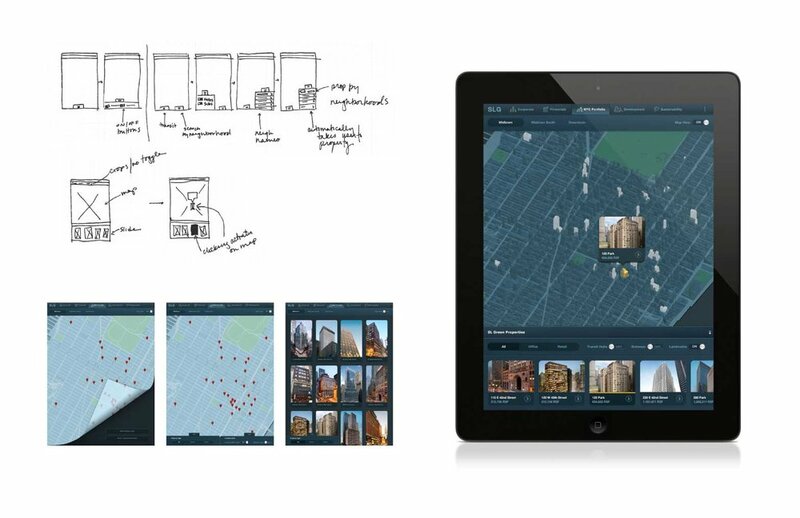 Sketches were first created on paper then on the computer to understand how the map navigation would work, the app's central function, since it was the most complex navigation and visuals within the app to inform other user interactions, and visual design within the app. The user needed to be able to navigate to properties via the map as well as through a list view. We experimented with different types of rails and pull drawers before settling on a dual view with the map and property listing at the bottom. Filters were also incorporated into the bottom rail to showcase transportation and points of interest on the map. Property information section features specifications, images, floorplans, availabilities, and 3D building renderings for corresponding information offering a robust experience for leasing. A system of company information pages were created for statistics, graphs, and charts.